I'd like to thank Celestial Elf for sharing this wonderful, informative article with us. You can read more about Celestial Elf and his amazing machinima film work in the Artist Interview we conducted with him earlier this year. 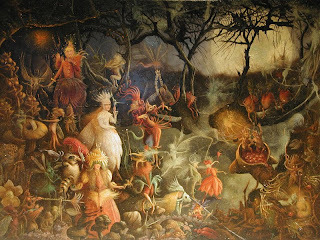 All Hallow's Eve on 31st October is more important than All Hallows Day itself. The Celts called this time Samhain (pronounced Sow-in), which means 'summer's end' and this marked the end of the Old and Beginning of the New Year for the Ancient people, as the New day begins at dawn, so the Ancient New Year begins at the darkest time, the turning point. To commemorate Samhain, the Druids built huge bonfires ( bone-fires ) where the people gathered to honour their deities with burned offerings of crop and creature. When the celebration was over they would re-light their home fires from the sacred bonfires as this consecrated fire would protect them during the coming cold and dark of winter. This was the time when the 'Veil Between Worlds' was at its thinnest. They also believed that when their beloved people died, they went to a land of eternal youth and happiness called 'Tir Nan Og'. At this time they held a Feast for the Dead, as it was believed the dead could return to this land of the living for just one night, to celebrate with their family, tribe, or clan. Thus the great burial mounds were opened up, with lighted torches lining the walls, so the dead could find their way & extra places set at the table for any who had died that year. On this night then, they might trick humans into becoming lost in the 'fairy mounds', where they could be trapped forever. This would seem to be the origin of 'Trick-Or-Treating' & possibly of the 'Jack-O-Lantern' as well, which was used by people who traveled this night to frighten away spirits or faeries who might otherwise lead one astray. An offering (often food or milk) was left out for the fairies and spirits on the steps of the house or hall, so the homeowner or clan could gain the blessings of the 'good folk' for the coming year. Such Halloween 'Games' as we have today clearly devolved from earlier rituals and beliefs..
Divination was practiced at Samhain and thought most likely to succeed at this time because the Ancient New Year's Eve exists outside of normal time, as the cyclical order of the universe collapses before re-establishing a new cycle, and therefore may be used to view any other point in time. Bobbing for Apples (sacred fruit to The Celtic people) evokes a Pagan baptism called a 'Seining' in which the water-filled tub is a Cauldron of Regeneration, into which the novice's head is submerged. That the participant in this game was blindfolded & with their hands tied behind their back also evokes a 'Craft' initiation ceremony. Bought by London Art dealer who took it to his restorer, they removed the "over paint"and discovered the use of nickel titanium yellow, a substitute for the 19th-century "Naples yellow". Nickel titanium yellow was not patented until 1939; Fitzgerald died in 1906. Dr Nicholas Eastaugh, a scientific consultant specializing in the analysis of paint, made a detailed study of the painting technique under a microscope, and compared it with known fairy paintings by Fitzgerald in Tate Britain and other collections. What he discovered, which was again hardly visible to the naked eye, was that Going to the Masked Ball lacked the precision of brushwork and finer details found in the other paintings. For me however the mystery over authorship of this work adds to the fascination of this very beautiful painting.